FPT Software on April 11 announced its cooperation with Yamaha to test self-driving electric automobiles in Ecopark Urban Area in northern Vietnam. FPT Software will apply the self-driving technology to electric vehicles used on golf courses. These vehicles were launched by Yamaha in Japan in January and Vietnam is the next country to receive the electric model. Ecopark is the first urban area to be chosen for testing the electric vehicles. During the initial test period, the vehicle will operate on a planned route, automatically moving on certain lanes, stopping when meeting barriers and turning back to the start point to end its route. In the fourth quarter of 2019, after FPT’s self-propelled technology integration, the electric automobiles will have advanced functions, including identifying, monitoring and avoiding other vehicles on the road; slowing down when barriers suddenly appear in front of them; and stopping at pickup and drop-off zones. When finishing their routes or if there are no passengers, the vehicles will automatically return to their parking lots. Users can order the self-driving automobiles through an application on their smartphones. FPT was the first firm to introduce the self-driving technology in Vietnam in October 2017. The firm had earlier received the approval of the Ministry of Transport to deploy autonomous vehicle tests in Saigon Hi-Tech Park and Danang Hi-Tech Park. 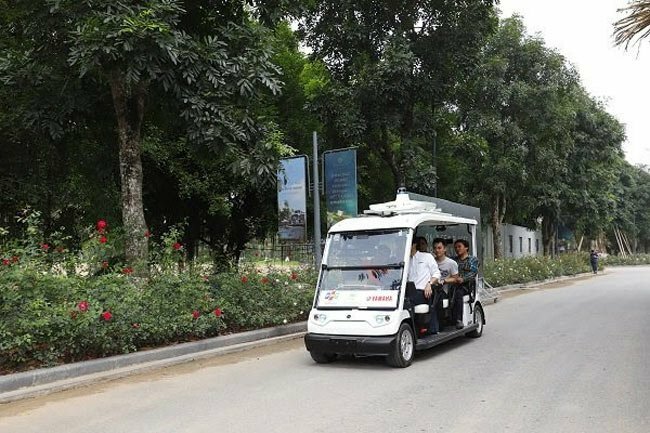 Hoang Nam Tien, chairman of FPT Software, said that self-driving electric vehicles will be put into service in the coming period, bringing greater convenience to residents and tourists.